Tedious or Physical Projects – Which are Harder? This entry was posted in Just Life on October 26, 2014 by Steve Tilford. Yesterday was a pretty productive day for me. It didn’t seem like it at the time, but now looking back upon it, I got a fair amount done. I was putting in the bathroom and am finally done just thinking and am actually constructing. I build the shower walls, most of the shower pan, put cement board on the floor and a few other misc. things. I had extra fortified topping mix, so I patched the back loading dock area of the building, which turned out to be the most rewarding part of the building day. I got home and the World Series game had gone to hell. The Royals were ahead, 4-1, then the Giants got a ton of hits and it was a blowout. I watched to the end, the looked through the mail. The new screen for my iPhone came. It only took one day after buying it on eBay. Supposedly it was sent from Springfield Missouri, but it seemed the company was really from China. 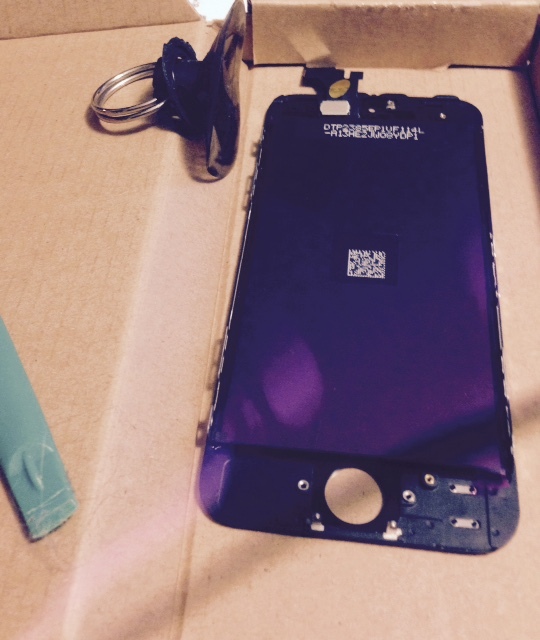 The LCD screen with digitizer was $30 shipped, which seems amazing after holding it in my hand. I went to Youtube and watched a short video showing how to do it. It seemed pretty simple, watching it. And it really was. The main problem was my agility. And eyesight. The screws are so small that it was hard to tell what tool to use to remove them. Apple uses a proprietary 5-point pentalobe screw which you can use other tools to remove also. I used a knife blade, but you can use a small nail too. It probably took me close to an hour to replace the screen, but I was going pretty slowly. I have cheap tools that don’t really bite into the small phillips, etc. It was close to 1 am before I was finished. It is nice having a new, clear screen. I couldn’t believe how wiped out I was this morning. I am way more tired that the previous week. 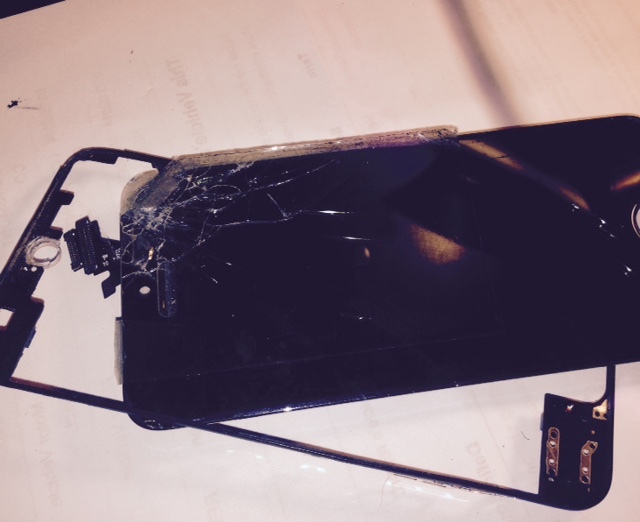 I am thinking that it was the iPhone repair, not the physical work. I’ve been doing the physical everyday for the past week. If this is true, it is amazing that just concentrating, with just a tad of stress, can physical rack you. Maybe it is just additive and Sunday needs to be a rest day. I’m meeting Joseph Schmalz in an hour, on gravel. He is riding over from Lawrence and I’m going to head back there with him. I haven’t seen Joseph for awhile, so it will be fun catching up. It is supposed to be in the mid-80’s, today. Very unusual for Kansas in October. I still have a back camera coming for my phone. My camera has been jacked for the past month. The camera looks way more complicated to replace than the screen. Better rest up for that one. New screen. You can see how jacked up my camera is. Both. And cool screen repair. Funny, you and I have very different ideas on what is tedious. I’d consider the construction project much more boring than electronics repair. That said, the tedious project is always worse. I think emotional effort tops both tedium and physical labor for exhausting work. I am a High School teacher and the effort of caring more about the futures of 75 humans than said humans care themselves is sometimes so mentally exhausting that it’s all I can do to get home and be reasonably civil to my own family. I swear every iPhone user I’ve ever met has cracked their screen. Why do you all put up with that? I’ve owned 3 different Droid phones, made by Motorola (2) and Samsung (currently a Galaxy S5).Have dropped them all many times, even on concrete, and have never cracked a screen. I guess it’s just the “cool” factor of saying you own an iPhone. To each his own I guess.